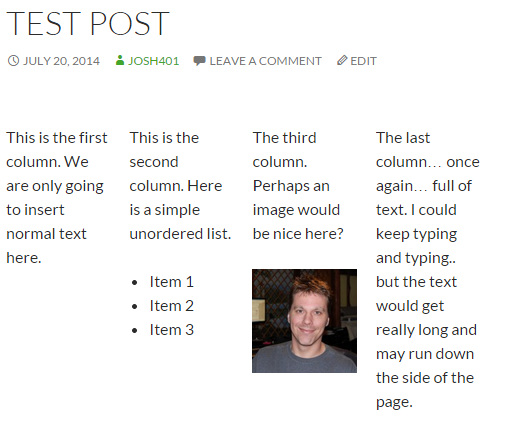 Dividing part of a post/page into columns is becoming more and more common. Unique layouts can be achieved; providing a more stimulating visual experience. Using column shortcodes, however, can often be a fairly tedious task. Remembering which shortcode and the proper format to use can be cumbersome. Instead, we decided to create an editor button which will negate the “guessing game”. The first step is to ensure the Column Shortcodes button has been added to the button arrangement; and saved. When first clicking the editor button, an overlay window will open where the first option will be visible. Simply select the number of columns which will be created. Once the number of columns has been selected; a new option will become visible asking for the column sizes. The available column sizes (based on the number of columns) will auto-populate. 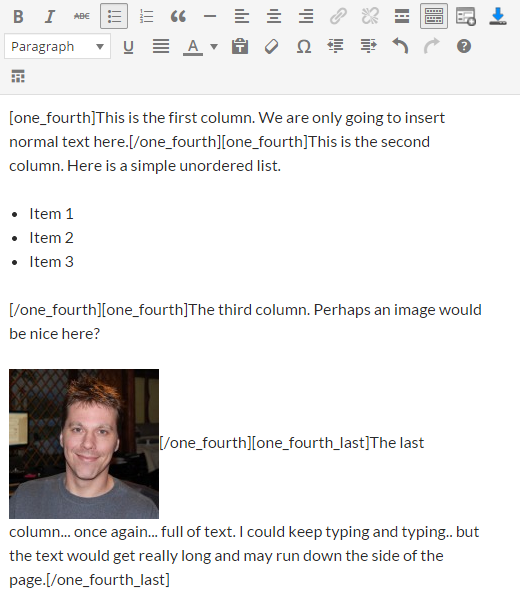 As a column size is selected; a preview will display illustrating how the columns will appear. 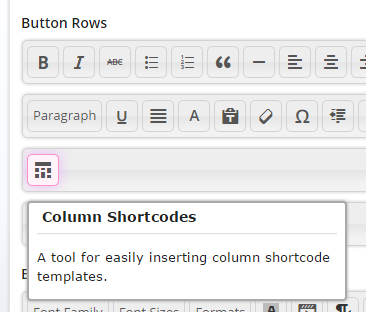 After the number of columns and column sizes have been selected; it’s time to “Insert” the shortcodes into the content editor. Clicking the “Insert” button will insert a template into the editor, where the content of each column can be adjusted. After the shortcodes have been inserted into the editor; the placeholder text (“CONTENT”) inside each set of shortcodes should be adjusted. Anything can be inserted into a column shortcode area including lists, images and links. Finally, preview the results to see the new columns inside the post. is this code wrong or in conflict? Very sorry for the inconvenience. I have just tested the shortcodes and it is working properly. I tried visiting the link you provided; but it resolves to a 404 page. Did you check the box in the WP Edit Pro admin page to enable the column shortcodes? Hi Josh, I’ve been using WP-Edit for a while now, and enjoy the ease of creating a WYSIWYG set up for our websites. In the free version, there is the column shortcode button. But, I’ve NEVER been able to get this to work. Any reports back on plugin conflicts? Or, is this feature ONLY available in the PRO version? Please advise. The Column Shortcode button is available in both the Free and Pro versions; and functions exactly the same in both. I just tested with WP Edit (free); and the button is working fine for me. Did you enable the column shortcodes functionality from the WP Edit settings page (Posts/Pages tab)? I cannot get the column shortcodes selection box on the WP Edit settings page (Post/Pages tab) to stay checked. There is no save button at the bottom of the tab. I am using the Weaver II theme. Hello, I am very sorry for my delay. Can you please create a ticket on our Support Forum? I will be able to provide much better assistance there. When a new button is added to WP Edit Pro (or removed).. it won’t become available (or be removed) until you click the button to save your button arrangement. So, head to the WP Edit Pro settings page; click the “Buttons” tab; and click the button to “Save Buttons”. You’ll see a neat little message at the top of the screen letting you know if any new buttons have been added (or removed). I suggest watching the Changelog after each plugin release; to see if any new buttons have been added (or removed). Glad you got it working properly. Please let me know if you have any suggestions which would make it better. I just discovered your plugin this weekend while trying create columns and change fonts inside of posts and pages… as contrasted with changing the font across the entire theme. The font part was pretty limited on the basic version though I may have fumbled it all up just setting it up. However, I was not able to make the column feature operate in any manner for three columns, each at 1/3. I ended up going back to Ultimate shortcodes to get columns working but even then it was kind of hit & miss–it’s probably my lack of knowledge and experience. Later in the evening I tried out the demo of the Pro version but it was timing out pretty fast, maybe because I ended up leaving the site, looking for content to try out in the demo. What was not there, in the Pro version demo was the columns feature. The redux is that I am pretty sure that columns does not work in the basic version and it was not available to test in the Pro version demo I tried on Sunday afternoon. I am running wordpress 4.1 with the 2014 theme. I can say that the google font part worked in the demo, very well! If I had some confidence that the columns feature was easy to use and reliable, I’d have purchased the upgrade last night. Have you run those features on version 4.1 and the Twenty Fourteen theme? Sorry to be long… snowing like crazy outside, getting cabin fever, about 35 miles NE of Boston. Bud, I am from New Orleans… “we’re not in Kansas, anymore!” Gonna be a LOT of snow by tomorrow. I did basic training at Ft. Knox, long before you were born… and we had some snow there, too. Hi Bob, and thank you for posting. Yes, the demo site was loading an older version of the plugin (which is why the column shortcodes were not there). If you go and try the demo site again, you should have access to the column shortcodes button. Yes, the timeout is set to 30 minutes… and the site purges and resets. This is definitely too fast, and I’ll change it to 120 minutes. We just got a foot of snow here last night (Louisville, KY).